According to current scenario, there are different kinds of industries which follow various methods to make their product a success. In order to survive in the market, industries follow various strategies to compete in the market. One important process is benchmarking. It involves choosing the best method to produce a product by analyzing it and comparing from the market standards. The main aim of the benchmarking is to understand the performance of the organization in related to the best practice method used which will help it indirectly to identify the areas of improvement. Benchmarking process involves comparing their business methods and policies with other competitors with respect to the performance, and financial considerations. In this post, you will understand the various types of benchmarking, its features, purpose and limitations. The benchmarking methods vary in many ways and are followed by different organizations according to their need and financial abilities. Here are the few most common benchmarking process followed. It is a process of comparing the organizational methods and performance with the other peers of the same industry. It is a process of comparing the various methods and performance internally within the organization. In this internal benchmarking, the internal performances of various departments across the varied locations in the organization are compared. In competitive benchmarking, your performance is compared with the direct competitors. Data collection is considered tough here but one can gain more inner ideas about the competitor’s performance and its reasons. In this type of benchmarking, the comparison is made with the leaders in the field. In this category, data collection can be considered tough and tedious but you should know that you’re comparing with the leaders and pioneers in business. There is a good scope for this type of benchmarking and can bring in a lot of innovative ideas. Following are the few types of benchmarking derived from the base of internal and external benchmarking. It is a type of benchmarking, the employee of the organization would demonstrate how other top performing organisations would perform the same task. Process benchmarking is done by collecting information about other company’s strategies through research, visiting the sites, through workshops conducted by other companies. Process benchmarking gives a clear comparison of the other organization’s ideas and their market strategies with them. Before commencing a new idea, members of the organization would analyze their new strategy in terms of a long time. In this strategic benchmarking process, they would compare the winning strategies of the companies in the marketplace. Strategic benchmarking has always enabled choosing a high performing strategy. Product benchmarking is based on the reverse engineering concept. Here any organisation would purchase the competitors’ product and break down into pieces to know its various features and performance ability. By this, they would improve their products performance by analyzing the basic working of the others product in the market. Corporate benchmarking is not about comparing the working or performance of the product but a comparison of various divisions of the organization and basic studies to improve the organization’s working model. For example, in corporate benchmarking, they would compare other organization’s marketing division, finance, research team, and testing squad etc to improve the overall efficiency of the organization. Global benchmarking is an extension of strategic benchmarking where the comparison of the strategies takes place globally. For example, Microsoft operating in USA would compare its accounts division with Mazda of Japan and found that they have employed 500 employees to do a 5 people job. 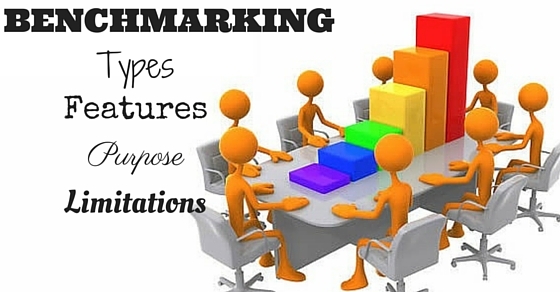 Collaborative benchmarking is something which happens within the organization. Where the Information technology team would collaborate with the IT support centre to Information technology division. Various other team collaborations would also happen by discussing the various team strategies. This type of benchmarking is very common among all industries. SWOT analysis, this type of benchmarking is something which gathers information about the companies strength, weakness, opportunities and threats to help the management do it better. Organizations usually study and do research on the successful organization’s winning practices. By doing this type of benchmarking, they would get a clear picture of their practices and there is more scope of improvement. There are many businesses that look forward to get associated with different business sectors or same functionality so that new and innovative ways can be found out to enhance similar work functions or process. Improvements and innovations can be brought about in business by following this method. This type compares the financial analysis and makes a comparison with the results so that the complete productivity and competitiveness can be achieved. In this type, the leading organization or concern which best carries out its function is studied. This is another category which takes into account analysis, collection and related energy performance data of various activities with the main intention to compare and analyse the performance of various entities. When entities are mentioned, they can be varied such as buildings, processes or companies. Benchmarking has various features which contribute a lot overall to the organization in terms of growth, development of new divisions, new technology adaptations and many more. Here are the few features of benchmarking which makes it a successful method. Feedback is always important for any organization. By using various benchmarking methods, the organization gains good customer feedback. This is because it helps to improvise the needs of the customer, meet the quality level expectancy and better delivery speed. Benchmarking contributes to raising the company standards by comparing it with various performers in the market. For example, by the process of benchmarking the organization might be able to raise the overall standard of the equipment used in production etc. Benchmarking works towards the improvement in various learning methodologies adopted by the organization. It helps the organization to learn new methods, adopt new ideas, and new work model etc. Benchmarking gives inspiration from various pioneers of the market. For example, it the various inspirational stories of the leaders in the market and encourages the employees to do bigger innovations. When something is not appropriate or up to the mark, benchmarking helps the organization to recover from the mistake happened by throwing some light on the areas which have to be altered, and new ideas to improve the losses occurred. Benchmarking gathers information about the educational standards of the other organizations and new learning techniques followed. By this, it motivates the employees of the organization to get a better education. Benchmarking helps the organization to adopt new technologies which is prevailing in the market and which is successfully adopted by many organizations. Benchmarking helps the organization to stay focused on the overall well being of the organization by displaying the various market demands, customer expectations and the net profit gained by other organizations. By this, it will make the employees force externally and not only about the internal factors. Benchmarking not only does welfare for the organizational growth but also encourages employees career growth by supporting and encouraging them in bringing better outputs, and also helping them in eradicating the mistakes committed by them in their previous product developments. There is a myth about benchmarking among people that benchmarking process is only used by larger organizations. But as per a survey by experts, it is stated that more than half of micro, small and medium-size companies are planning to make use of this benchmarking process. The future use of benchmarking as a strategic tool to compare and analyze business services or products will help in the growth and progress of any organization which utilizes it. The main purpose of benchmarking is to make the organization move with the market expectations and also compete with the industry standards followed by various other organizations. It does not only concentrate externally but it also works on various internal factors. A benchmark report helps in quickly analyzing the health of a business. A benchmark report is one which helps in examining aspects such as production amount, revenue, expenses, employee productivity and more. Benchmarking is followed across all companies such as private, public, non-profit, as well as in industries such as technology, engineering, education, manufacturing and more. By using various benchmarking strategies, it helps the organization to show improvement year by year. 1. It analyzes and understands the organization’s existing working model. 2. It compares the organization’s working model with the peers of the organization. 3. Compares the various organizations working strategies with the successful other organization’s working model. 4. Suggests the necessary steps to compete with the leaders in the market. 5. Compares the profit rate of the internal divisions to motivate the betterment in weaker divisions of the organization. Companies are able to become more competitive by taking a look at other companies and their performances. They are able to identify ways and ideas in areas which they are underperforming. The main beneficial factor of benchmarking is that they are able to identify and improve their weak areas. They gain the ability to accelerate the process of change as they gain knowledge through this benchmarking process. Benchmarking only suggests the organization to improve on weak factors. It does not have any proving factor to adopt the strategy it recommends. Everything is a pure suggestion and does not give any straight answer for issues. The result comparisons or profit rate of the other organization are mere numbers. Benchmarking does not show or concentrate on minute factors which have been adopted by the other organizations. This simply implies that it helps to show an outer look nothing deep into the business strategy of other organizations. It has to be properly adopted by following the various data collected. When it is not followed periodically, there might be no net result as it is not a one day process. Benchmarking only produces rough data and it is only the team or board members who have to concentrate on the whole process using the data collected. Sometimes managers do not understand the data collected, as it moves from various people and it is left unnoticed when not properly used. Benchmarking is not a one day task or a result which can be produced once followed. It is a big process which has to be followed regularly every single time once it is updated. No company or an organization has a fixed benchmark. It changes from time to time and it has to keenly follow to get the result. Even though it actively contributes to the welfare of the organization, its success depends upon every single member of the organization. The strategy tool called benchmarking can be utilized to make a comparison of business products and processes with various performances inside and outside the business. These valid pointers can be beneficial in many ways for the organization to follow and boost up their process in mere future. There are many sources which offer a realistic view about benchmarking and its various methods related to it. Organizations need to follow the aspects and make perfect moves in order to reach productivity and success by making a glimpse at other organizations.